The ATF report concluded that possibly a cigarette or match started the fire which then ignited some nearby flammable materials which caused the fire to spread rapidly. Accidental fire started → All but one guard gets out → Fire fighters were called late or arrived late and then were refused entrance → US military firefighting team (15 minutes away) was called to help an hour after the fire started but then 30 minutes later was told not to come because fire was under control → Prisoners were locked inside until 360 died → Fire not our fault → BUT → the massacre of 360 people can only be blamed on prison security forces and ultimately the government. To go back even further, in 2003, a prison riot/fire in El Porvenir (outside La Ceiba) resulted in the death of 65 prisoners and 3 visitors, some of them caused by bullets from the guards. After pressure by the International Court of Human Rights, and after many years of investigation and trial, some of the lower level El Porvenir guards received sentences of up to 240 years for their roles in the deaths. In 2004, another prison fire in San Pedro resulted in 107 prisoner deaths. 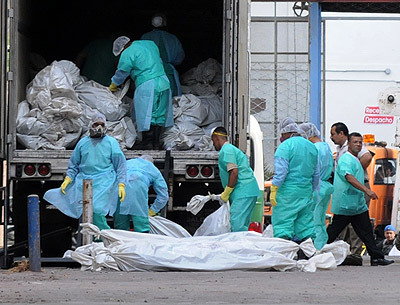 Coincidentally — or not — Honduras just this week admitted responsibility for those 2004 deaths before the same international court and promised to build a new prison, compensate the victims' families, and to realize a public act of recognition in May 2013. In typical feeble OAS fashion, the ICHR congratulated itself on complying with its mission of solving problems with this "friendly" agreement, which "guarantees that these acts will not repeat". Uh, what? In a national address about the fire, when mentioning that experts were coming from other countries to help investigate, President Lobo pointed out that other countries have had the same type of incident. That is so typical of Honduran politicians, to imply that every shameful, grotesque thing that happens in Honduras is no different than anyplace else. But national pride helps them to get away with it. Most people want to believe that the things that happen in Honduras are no worse than any place else. The majority of the population have no outside knowledge to make them think otherwise. How many other countries have had three such prison fires in less than 10 years in which a total of more than 500 human beings died? How many other countries have sent (a few) prison guards to prison with sentences of hundreds of years after proving in court that they purposely allowed prisoners to die behind locked doors, while they shot at any who tried to save themselves from burning to death? How many other countries, after two such prison massacres in which 172 people died, would not have developed some sort of disaster procedures to ensure that it never happened again? The most frightening question of all is: How does any person become so inhuman that they believe it is better to let hundreds of people burn alive than to — what? maybe get in trouble? — if they allowed them to escape the fire? Surviving prisoners say that the guards shot at prisoners trying to save their own lives. That may not be true, but until proven false, I believe it. It happened before so there is no reason not to believe it now. We can talk about guards being corrupt, inept, or poorly trained, but that doesn't answer the question of their basic inhumanity. How does a human being stand by doing nothing while allowing hundreds of people to die? One hardened criminal, a convicted murderer, risked his own life to stay behind and break the cell locks possibly resulting in saving some 250 lives. There were no similar stories about guards or firefighters. A few weeks ago there was a story on the news about some number of aged prisoners being granted a pardon or released because they never had a trial, or something. The news showed a group of those joyous prisoners: They all appeared to be in their 70s or 80s and looked like they weighed about 90 pounds each. They looked like the typical sun-wrinkled, humble campesino that you run into out in the country. Now supposedly under Honduran law, criminals over 60 years old do not have to serve prison time, but those men looked a lot older than 60 to me, so that law may be another one of the many laws that are meant to provide impunity to the corruptos but are ignored when it comes to the humble masses. Who knows if those old men were innocent, stole a chicken to feed their family, were hardened criminals, or never even had a trial? All of those are possibilities. All I know is that by the end of story, I was nearly in tears thinking about the injustice in Honduras, where stealing a couple of sheets of roofing tin gets a man 8 years in prison while stealing a couple of million dollars might get a rich man transferred to a different government appointment so as not to embarrass him or his family or the president who appointed him (and who has probably stolen 10 times that amount). Whenever I think about the latest prison fire, I think about those frail old men and hope that the "paperwork" went through before the fire, though it is doubtful that anything could get through the injustice system in Honduras that quickly. Reports are that more than half of the 850 prisoners inside the Comayagua prison had never had the benefit of a trial. 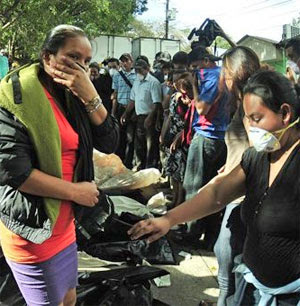 But the Honduran prison fire, as horrendous as it was, was replaced long ago in the Honduran news by newer scandals. Life — and corruption — goes on in Honduras. 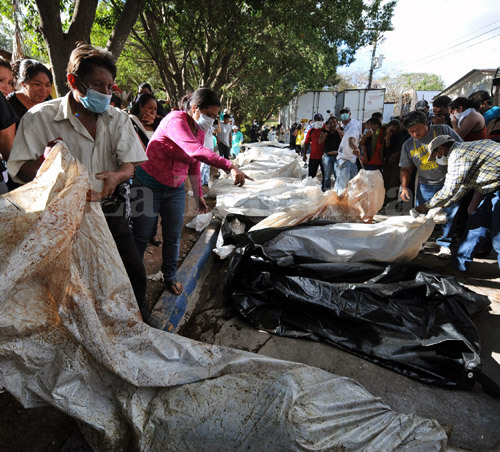 The victims' families will be compensated and money eases a lot of pain in Honduras. Each hot new scandal helps to sweep the previous one under the rug. After all, the human psyche can only hold so much tragedy and injustice. The abnormal becomes the normal, and before long, citizens become apathetic. There really are no other options. They live in a society of fear: fear of criminals, fear of police, fear of losing a job, even fear of being murdered for doing the right thing. They know nothing is going to change because it never has. For most, there is no sense in risking their livelihood or lives in trying to change it. Addictive drugs are bad. There is no doubt about that. The only ones who think otherwise are the ones who are or will screw up their lives by using them. But can or should any government try to protect its people against their own stupidities? I admit that I'm one of those people who tends to think of things in black and white and have not thought decriminalization of drugs was a good move. However, after seeing seeing things from the viewpoint of what has and is happening in Honduras for the past 10 years, I'm having to rethink that idea. Mary Anastasia O'Grady reports on an interview with Guatemala's President Otto Pérez Molina in today's Wall Street Journal. President Pérez is trying to rally other Latin American countries to join him in challenging the "doomed US drug policy". He points out the problem of increased violence in already overwhelmed countries along the drug routes as well as drug money penetrating and corrupting police, prosecutors, and judges, resulting in even more corruption and impunity. "In an interview at the national palace here earlier this month, Mr. Pérez Molina told me that he believes at least some of his counterparts in the region are ready to join him in pressuring Washington to rethink an agenda that has fueled a boom in criminality in their countries while doing nothing to contain American drug consumption. "The president of Mexico [Felipe Calderón], after five years of the effort he has made, has told me that he believes we have to sit down and talk seriously about decriminalization in order to find an alternative approach." The president of Colombia [Juan Manuel Santos] "has more or less" the same view, Mr. Pérez Molina said. "It is notable that the rhetoric we are hearing against the drug war is not coming from anti-American, left-wing demagogues trying to promote populist, nationalist ideals by stirring up the mob. Today's most vocal proponents of a change in regional drug policy are center-right governments. Their proposals are driven by observing 40 years of failure." President Pérez joins many ex-presidents of Latin America who have been speaking out for years. One of the most notably outspoken presidents is former Mexican President Vicente Fox who has taken a leading role in this issue. "The president (Pérez Molina) says that "as long as you maintain the demand there will be supply," but that's not his only gripe with the U.S. It identifies the cartels and thugs in Latin America. But "who in the U.S. is receiving and distributing the drugs," he asks, and why don't we ever hear about them? Mr. Pérez Molina is not the only Latin American who wants to know." The Online Wall Street Journal is subscription only but you may be able to access the complete article with this "Free Pass" or by clicking on the link from this google search. Darn good questions! Honduras confiscates thousands of kilos at a time, as other Central and South American countries do, and the US says they need to do more (and I'm sure they don't confiscate all the authorities know about). I don't keep up with the US news so maybe you all can enlighten me — Are there frequent drug busts in the US where they confiscate tons at a time that made it through Honduras, Guatemala, and other transit points? If not, why not? 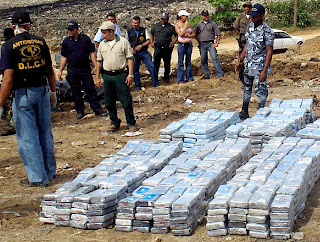 I think Honduras should decriminalize drug trafficking and just offer safe passage through Honduras territory and tax the heck out of the pass-through instead. I know that will never happen and the reason is threat of losing US foreign aid to this failed nation. Let the US deal with the entry of the drugs to the US if that is something the government really cares about — but after 40 years of failure (Republican and Democrat, so don't go there), you kind of have to think that it ISN'T something that the US really cares about. The US spends trillions on other wars. By comparison, the amounts spent on the "war on drugs" has been trivial and is decreasing even more in 2013. 40 years! How can anyone even claim with a straight face that the US has a war on drugs? If the US can't stop major drug trafficking into the US, just how in the heck can they possibly be so hypocritical to think that Honduras can patrol the jungles and large uninhabited areas of its country when they can't even keep their people safe in the major cities and don't even have gas money for police cars in much of the country? We're brainwashed in the US to believe that Americans are the innocent victims of these brown-skinned, mustachioed narcos — as they are portrayed in the movies — and no one would ever take drugs if it wasn't for these evil people. But the US is or was the most powerful country in the world and if they wanted to stop the entry of drugs, they would have done it long ago. It's time that the US started taking responsibility for the innocent countries who aren't drug producers or users (for the most part) who have been so terrorized and terribly damaged by the US's failure to handle their own drug issue. Somewhere around 90% of the illegal drugs in the entire world are consumed in the US, so who is really the guilty party here? It's kind of like blaming all the prostitutes but giving the clients a wink and a nod. I see celebrities and sports figures all the time on TV joking about their drug use. At most, they get a slap on the hand and even that is very rare. The US has already effectively decriminalized drug use, at least for the rich and famous, and even the middle class who can generally opt for drug treatment instead of prison time. A few months ago, the Honduran military was talking about buying ~ $400 million in high tech drug planes. How can anyone who knows there are people starving in Honduras, people suffering and dying for lack of even the most basic health care, schools that barely teach kids how to read, much less think, etc., possibly believe that Honduras should devote more resources to fighting the US drug problem? By no means do I blame all or even most of Honduras' woes on US drug use. 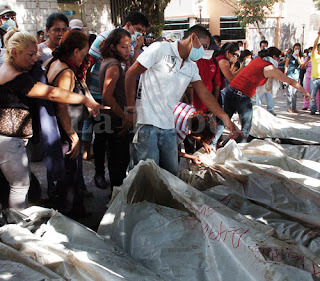 Honduras has a centuries-long culture of corruption, of disregard for the poor, of impunity, and a poor justice system. But crime, violence, and homicide have skyrocketed in the past decade, which coincides with Mexico and Colombia's US-led crackdowns on drug trafficking. While Colombia's homicide rate went from 67 per 100,000 population in 2002 down to 33 per 100,000 currently, Honduras' homicide rate has gone from an already high 34 per 100,000 in 2002 to an astounding 86 in 2011 (compared to a relatively stable ~5 per 100,000 in the US). Like cockroaches, spray in one area and the narcotraffickers scurry to another. 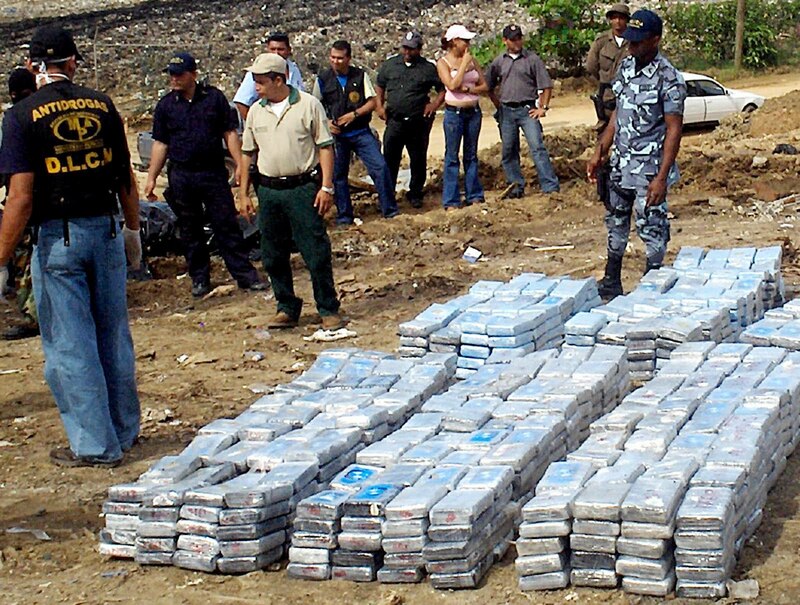 Colombia cracked down on narcos and they fled to Mexico. 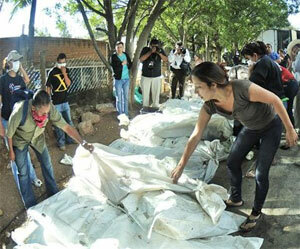 Mexico cracked down and they fled to Honduras and Guatemala. Meanwhile, there has been no perceptible change on drug use in the US. I don't expect anyone to agree with me, but I hope you'll think a little deeper about what has been happening for the past 40 years and particularly the harm that has been done the last 10 years in Honduras and other Latin American countries because of the US's insatiable desire for drugs — not just damage to the countries, but tens of thousands of deaths, some of them committed with guns that the US government purposely allowed to enter Mexico and Honduras. What's the Honduran government's cut of your travel costs? A law was passed in December 2011 to increase the airport departure tax from around US $34 to around US $60 to generate money for InterAirports to build the new Palmerola airport. The increase in exit fee was not discussed or made public, and only came to light later amidst a ton of bad publicity prompting congressional claims that they didn't http://www.blogger.com/img/blank.gifknow what was in the contract that they had approved. Ultimately, due to the possible affect on tourism as well as business travel, President Lobo vetoed the decree. Then in January, the media discovered that yet another increase to the airport taxes had been passed by congress on that very same day. This one was an increase of US $34, or a charge of US $17 on arrival and US $17 on departure for all international travelers. Again it related to a contract, the Securiport contract to provide better immigration control of visitors. Again, the congress claimed to not know that they were approving an increase in taxes. And again, even though President Lobo personally had ordered the contract specifically with Securiport under an "emergency" decree (no public bidding process), he vetoed the decree due to the bad publicity and outrage by congressmen saying that they had been tricked. This second tax, combined with the other law, would have made the total Honduran "entrance/exit" fees charged to travelers US $94, approximately three to four times that charged by other Central American countries. And that's not even considering the hefty 12% sales tax, 15% liquor tax, and 16% hotel tax that travelers already pay while in Honduras. Discussion of those new taxes led to comments from travelers like "Honduras already has the highest airport taxes" or "I already pay US $250 in Honduran taxes plus the $34 exit fee", and "We already pay a lot more for a round trip from Honduras than others pay for a round trip to Honduras!" That piqued my curiosity. Was it true that Honduran taxes on air travel were already high even without these new laws? I couldn't find any law on transportation taxes, so, curious to find out exactly what taxes were charged on airline tickets, I asked people to send me copies of their online ticket confirmations to see what I could figure out. With the initial batches of tickets that I received, it appeared that this wasn't really a "Honduran transportation tax" as it was described on the ticket fare breakdowns, but a sales tax of 12%, the base Honduran sales tax rate. All of the initial breakdowns that people sent me included a tax of 12% of the base fare of the ticket when the originating flight left from Honduras, and no Honduran tax if the flight originated in another country. I thought I had it figured out. Then a couple of people threw a kink into my theory after sending me ticket cost breakdowns that reflected a 15%, 16%, or 18% Honduran transportation tax. Still unable to find anything definitive, I reluctantly put it aside as one of those Honduran mysteries that I couldn't solve. Today while looking for another obscure law (which I couldn't find either! ), I ran across the Sales Tax Law and decided to see if it said anything specifically about airline tickets. Ahah! 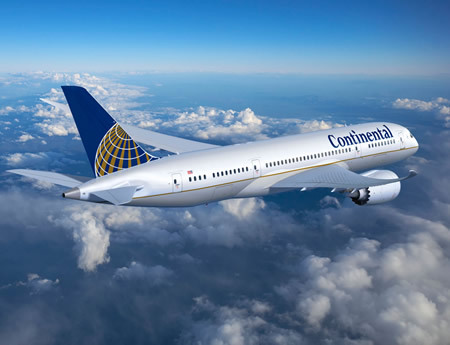 The law says that national or international airline tickets, including those emitted by internet or other electronic means, are charged the 12% sales tax, depending on where the orders or tickets (electronic or not) are emitted or in the place that the passenger will board. All of the 20 or so tickets that I initially reviewed were taxed at 12% if the flight originated in Honduras. If the flight originated in another country, no Honduran sales tax was charged. The tax is charged on the entire base fare plus fuel charges, if any, even if future legs of the journey originate from and arrive in other countries. For example, one itinerary originated in San Pedro and included a trip from Newark to Hong Kong. The entire base ticket price was taxed at 12% by the Honduran government! If you want to save money on a multi-leg journey, you might want to check into booking your later non-Honduran flights separately. The US charges a boatload of taxes on airline tickets, but the total doesn't come close to approaching 12% of the base fare except on lower dollar tickets (under $500 or so). So the first part of my theory was correct. But what about the tickets which reflected higher tax rates? Assuming that there was a more recent law, I googled again using "impuesto transporte aéreo honduras" and found several newspaper articles. In March 2010, as a part of Lobo's first tax paquetazo, the sales tax on first class, executive class, and business class tickets was increased to 18%. Based on the tickets that several Honduran residents sent to me, I was able to determine that only the first class (or similar upgraded) portion of the ticket is charged 18% sales tax so that is why I saw "Honduran transportation tax" being charged at various percentages of the base fare, ranging from 12% to 16% to 17% or 18%. The odd rates were when the traveler flew regular class in one direction and first class the other. If the entire ticket was first class, tax of 18% was included. So now you know exactly what taxes you are being charged by the Honduran government. They are going to get 12% of your airfare (18% if you fly first class), 16% on your hotel costs, 15% on liquor costs, and 12% on restaurants and just about any other purchases you make ... at least until the next sneaky law is passed in the middle of the night. Yes, the Honduran government would definitely profit from working on promoting tourism more than they do! P.S. Thanks so much to all of you who sent me your ticket breakdowns. This question was driving me crazy! See that bridge over there? I can't remember where I heard or read this joke so I can't give proper credit but it is just too funny and too true to not repeat. I think I heard it from a Honduran on a Honduran talk show so don't take offense! I'm not too much of a joke teller, but I get some great laughs from this one. A Honduran mayor went to visit the mayor of his "sister city" in Spain. The Spanish mayor invited him home for dinner the first night of his trip. Before the dinner, which was fit for a king, he showed the Honduran mayor around his palatial estate. The house was a mansion with finely carved furnishings, thick oriental carpets, golden faucets, and servants galore, waiting to attend to their every need. The mansion was situated on several acres of an immaculately landscaped hill overlooking a river. The Honduran mayor, who we'll call Don Tomás, was suitably impressed and said, "I'm just a humble mayor from a poor pueblo in Honduras. I can only wonder how you can live in splendor like this. Spain must pay its mayors much better than Honduras does." The Spanish mayor, who we'll call Don Carlos, patted Don Tomás on the back and said, "It's not so difficult. Let me tell you what I did. Perhaps you can do the same." Don Carlos pointed out the window toward the river. "Do you see that bridge over there?" Seeing the narrow wooden one-lane bridge crossing the river, Don Tomás replied, "Si". 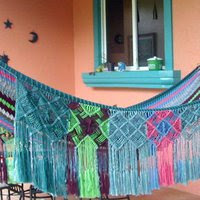 "Bueno, I was able to obtain generous international aid to build a bridge for our little pueblo. But instead of building a big expensive two-lane bridge, I built a one-lane bridge and with the excess funds, I am able to have all of this." explained Don Carlos, throwing his arms wide to encompass his luxurious surroundings. "Simple, verdad?" "Hmmm," thought Don Tomás, pondering what he had been told. A couple of years later, Don Carlos came to Honduras for a visit, and of course, called on his friend, Don Tomás. He was surprised to find that Don Tomás was living in splendor every bit as wonderful as his own. Don Tomás appeared to have even more servants, probably due to the lower cost of wages in Honduras, he thought. "Don Tomás! How did you amass such wealth in such a short time? This is splendid! You are to be congratulated!" he exclaimed. Don Tomás smiled slyly and took him over to a window overlooking a river. "Do you see that bridge over there?" Don Carlos looked out the window at the river. He moved to right and leaned out to get a better view. He leaned to the left to view the other end of the river.